The Market Square, also known as the Agora or Commercial Market, was the commercial centre of the city. It was located along the right side of the Marble Street (directing from the Great Theatre to Celsus Library). It consisted of three large gates, one to the north, one to the west and one to the south. The southern gate of the Agora was that of Mazeus and Mithridates which led to the Library of Celsus. There was a two-storey Doric style stoa with columns to the eastern side of the Agora and a row of shops behind it, where food and other manufactured goods were sold. A water clock and a sundial had been placed in the middle of the square structure which was surrounded by colonnades along all the four sides of it. Moreover, a portico had been constructed along the east, the west and the south side of the Agora which contained two rows of shops. 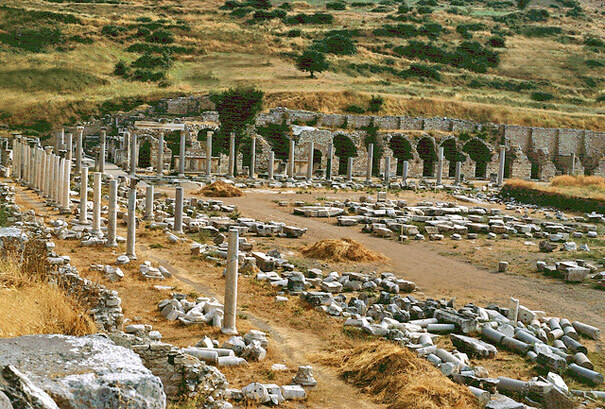 The Agora was built during the Hellenistic period yet a lot of changes were made to it during the reign of Augustus.